While meandering through the aisles in Michael's, I stumbled upon these sweet little letters. I knew the second that I saw them that they would make perfect ornaments. I originally thought that I'd wrap them with yarn, but I found something better: glittery chord! 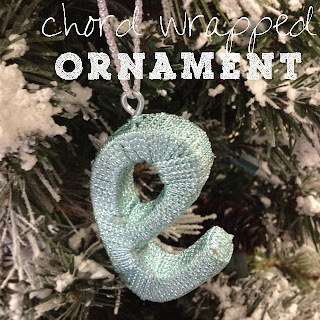 I won't say that these were "simple"...because it did take some time to make sure the chord wrapped around the letter nicely and covered the entire thing. However, all it took was an eye hook, some chord & a hot glue gun and I had some fun little ornaments to include in some of my Christmas gifts. Even though they're a little late for this year, I'm sure they'll look adorable on the tree next year! We still have a few days til Christmas, so you are alright! I still have a few holiday recipes to try & post about! LOL! Added you to G+!